The fresh milk-using-up-debacle continued with the fresh hell that is a ball of ricotta. Last June, I was at a food event, chattering away over good wine and amazing nibbles (the struggle is real, I know). Mid-convo, someone tapped me on the shoulder “We went to school together” – “No we didn’t” I replied without even thinking. I’m a real charmer. I have a familiar face, so I’m often asked if I was at another party (sadly not), if I was at another event (possibly). She persisted – “I was – the year above you” “What, did you go to St Greg’s” I rolled me eyes “YES!” and low, dear readers, I was mortified. The most Marvellous Victoria Glass wrote a food waste book last year; quite why 2 food waste writers went to the school I don’t know. We did do home ec (as it was then), but it was hardly the hotbed of food education. When I put out my plea, Victoria suggested rictotta from her book, ‘Too Good to Waste’. It’s too hard! I worried “Piece of piss” she said – and she was right! The ricotta is a doddle to make – but now I have to think of ways to cook it. Because I made it. And I, weirdly, don’t love it. But I know I’m in the minority here. And I’m determined to overcome this one. I don’t *have* to, but I’ve found a love of olives, stronger cheeses and spicey curries through determination and, really, I just want to be able to be more greedy. 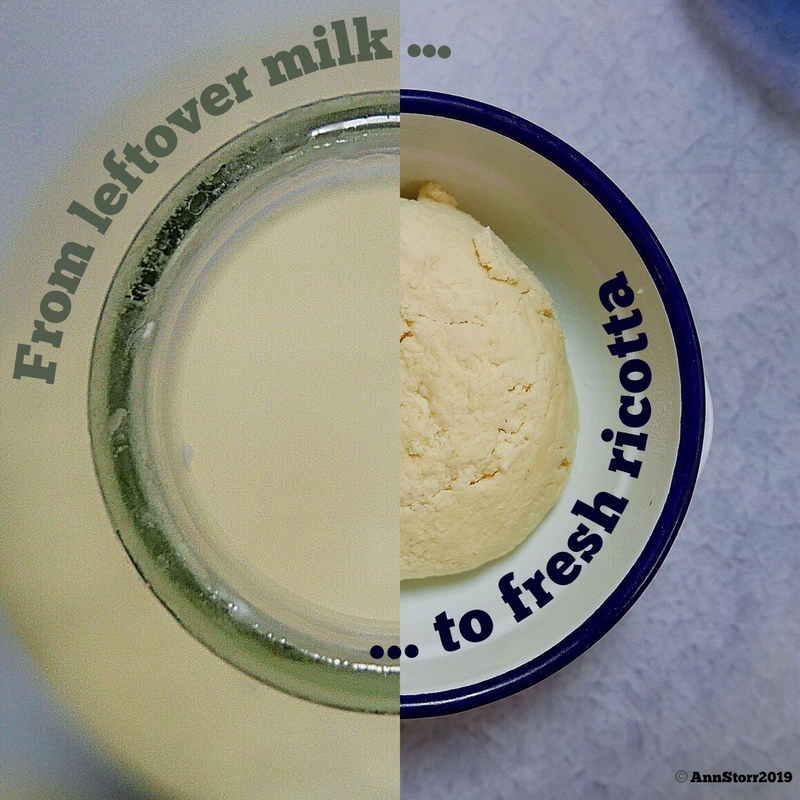 Note: you can only make ricotta if you have whole milk; there isn’t enough fat in other milks. Preachy time – I try to buy food in its least fucked around with form. That is, of course, a fairly impossible branding standard to explain. So I buy cheese not sliced or grated cheese; whole milk which I can water down if I need to; tins of tomatoes rather than a jar of sauce. After years of skintness I know that I saved money because sour milk can mean soda bread, but a jar of mouldy sauce just has to go in the bin. So, can I tempt you to buy whole milk? And go nuts and stretch to organic unhomogenised if you can. Not everyone can. Money is tight. If you can, just try it.